A350 XWB News: Commonality and Innovation were the 2 pillars to develop the A350 XWB cockpit. Commonality and Innovation were the 2 pillars to develop the A350 XWB cockpit. 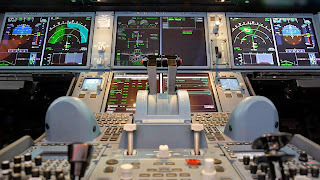 Airbus test pilots have been since 4 years involved in the development of the cockpit in the simulator. 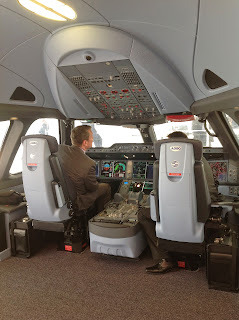 The design of the A350 cockpit is based on two pillars, says Airbus test pilot Jean-Michel Roy. "On the commonality with our other cockpit and on innovation." One of the most important aspects is the comfort. "If you sit for hours in the cockpit, you need a most pleasant environment. If it was quiet inside and nothing has vibrated, the pilots end up after ten hours just rested and thus better." These include comfortable seats, sufficiently large shelves, even for 1.5 liter bottles of water, effective sun visors and a good air quality, said Roy. Based on the article “Besuch im A350-Cockpit” published in Flug revue.